I came from TF2 (2007-2011) playing as medic in that game so what I like doing is just using the med pouch and consistently looking at teammates' health so I can keep ppl maxed out and reviving people while always makin sure to hit Q on their bodies so they know I'm coming. I used to have the medic crate equipped, but since people never stop running, I figured the pouch would be better since it sticks to teammates far away and heals them while they run. 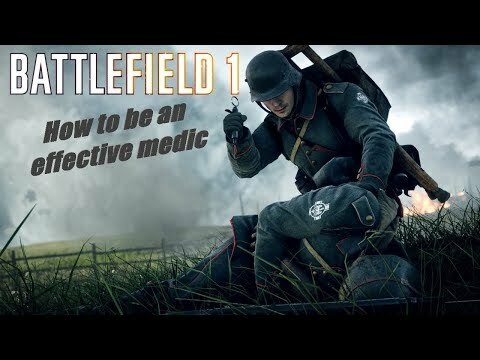 Try to continue with these tutorials in different classes and weapons, many of us will be grateful. Greetings and thanks for doing this. Bloody hell, I'm in Swallownest! Very small man! I’m just at Aston picking kids up lol! I've added you on Origin fella, would love to squad up sometime especially as we're both good players. I meant the segment from 6 31 on your first tdm video, it start's with the guy skipping revive after you have told them you're coming to get them up, and ends with you going down after valiantly trying to revive a downed team mate, only to be denied by sync by the looks of things, then finishes with you throwing a med pack - that sigh at the end, just sums up the bf1 medic experience.